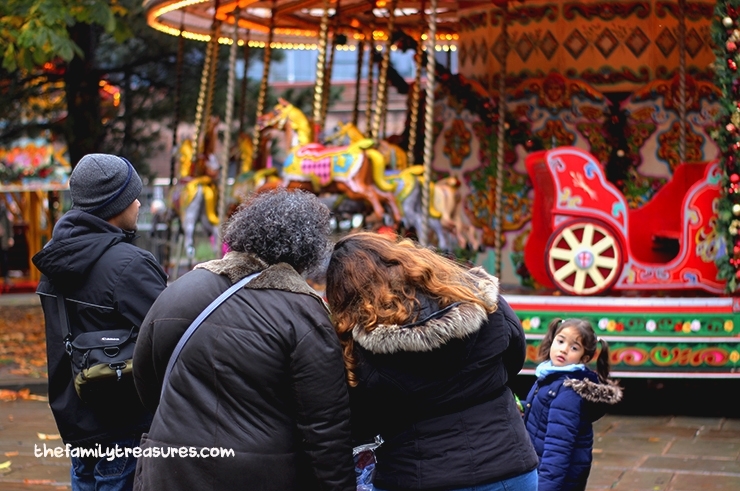 Even though we are on our 4th year since moving to UK we have never thought of going to the so well-known Manchester Christmas Market, let alone going with the kids. So we decided that this year would be different and taking advantage that we had family staying with us over the weekend we decided to give it a try. It is always a good excuse to go when you have someone who is not local. Let us share our experience with you and maybe you can get some tips so that if you decide to visit you can make the most out of it. Because we live 20 minutes drive from the centre we went by car, but usually the most affordable way of going is by Metrolink. If you’re travelling with the family they have a family ticket you can get, which I think goes around £6 for a day travel card (2 adults + 3 children) which is really good. So as I said, we drove there cause it was just more convenient for us, but unfortunately we had to spend a bit too much on parking. It was raining and to be honest, I wasn’t in the mood to walk 20 minutes so I could get a better price. Sometimes it’s worth doing it if you’re with little ones and you know they will get tired easily. 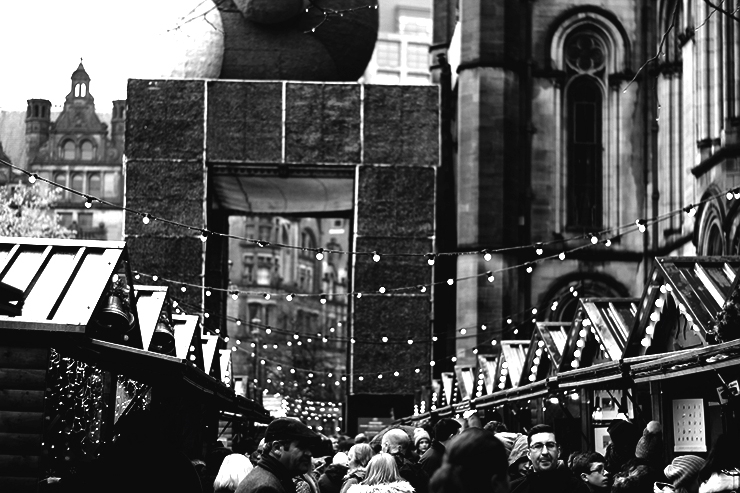 Before going I checked their website and saved their Manchester Christmas Market trail map. We walked down Market street, all the way up to Cathedral Gardens, where you can find the family friendly area. No alcohol allowed, more space to walk around and a few rides the kids can go. Also they have an ice rink. You can find exact prices on the website but it goes around £10 for an adult, £7 something for an under 14, for a 45 minutes session. Rides are usually 2 tokens and each token equals 1 pound. You can get them from the Ice Rink ticket office too. We weren’t that lucky on that day cause a couple of rides weren’t working but J had some fun at a little train. We used to live in Manchester – and I still miss the Metrolink, being able to get on easily with a buggy and getting into the city centre so quickly. Buses are so frustrating.